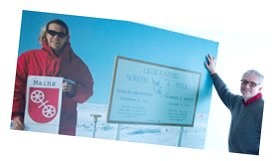 He himself has not been to the South Pole for some time now but Professor Lutz Köpke can still vividly recall his stay there. "Our station was on the Antarctic plateau at an elevation of approximately 3,000 meters above sea level. All you can see are snow and ice. Everything is white. It is true that you have to work a lot when you're there, but at some point you go outside, stand there, and ask yourself: Where the heck am I? It is deathly still all around you and you can hear the blood pumping through your veins. It's a wonderful experience!" The IceCube neutrino detector was completed on December 18, 2010 after six years of construction work. Since then its sensors have been searching for high energy neutrinos. "Neutrinos are electrically neutral particles that have almost no mass. In contrast with light, they pass through almost everything, even the Earth," explains Köpke. "Three hundred trillion of them pass through the human body every second." It is only very rarely that one of these particles gets held up. "Maybe only once in your lifetime will a neutrino react with your body. But of course you will not notice anything." Only those neutrinos that react with a medium can be detected. This makes it particularly difficult to find them. Another complicating factor is that not all neutrinos are the same. Most of these particles are created in the sun or the Earth's atmosphere. However, some come from much further away – and these long-distance travelers are what the researchers at the IceCube observatory are looking for. These are neutrinos with particularly high energy. "There are types of accelerators in outer space that feed high energy into the neutrinos." So, for example, high energy neutrinos can be created in the vicinity of black holes. "The more energy a neutrino has, the more likely it becomes that it will be stopped on its way through the Earth." IceCube detected 28 such neutrinos with energies higher than 50 terraelectron volts in the period May 2010 to May 2012. "By way of comparison, some of these had a thousand times more energy than the neutrinos we are able to generate in our particle accelerators on Earth." The neutrinos provide us with insights into cosmic processes that we previously did not think we would ever obtain. "Every time you have a new astronomical tool, you discover something new. Galileo discovered the moons of Jupiter; the modern radio telescopes showed us the interior of distant galaxies in fine detail. Neutrinos allow us to see even further into the center of cosmic explosions." Their discovery is considered a milestone. But why is IceCube searching for neutrinos at the inhospitable South Pole? Wouldn't another location be more convenient? "For a neutrino observatory to work, you require a transparent and clear medium. In the 1990s, the Russians used Lake Baikal for this purpose. We wanted something that was even clearer." Thus the scientists and their helpers constructed IceCube and its predecessor project AMANDA on the South Pole plateau at 3,000 meters above sea level. 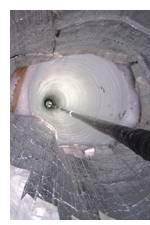 Using a hot water drill, they created 60 centimeter-wide channels vertically in the ice. "At a depth of more than 1,000 meters the ice is very clear and there are no longer any air bubbles." The workers lowered cables into the ice over an area covering one square kilometer with 5,160 sensors arranged like pearls along these cables. 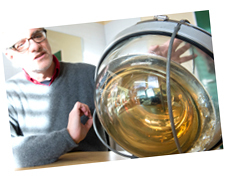 "I have one such sensor for you here," says Köpke and places a glass ball with a diameter of 35 centimeter on his desk. "You can see the eye in the middle, that's our sensor." 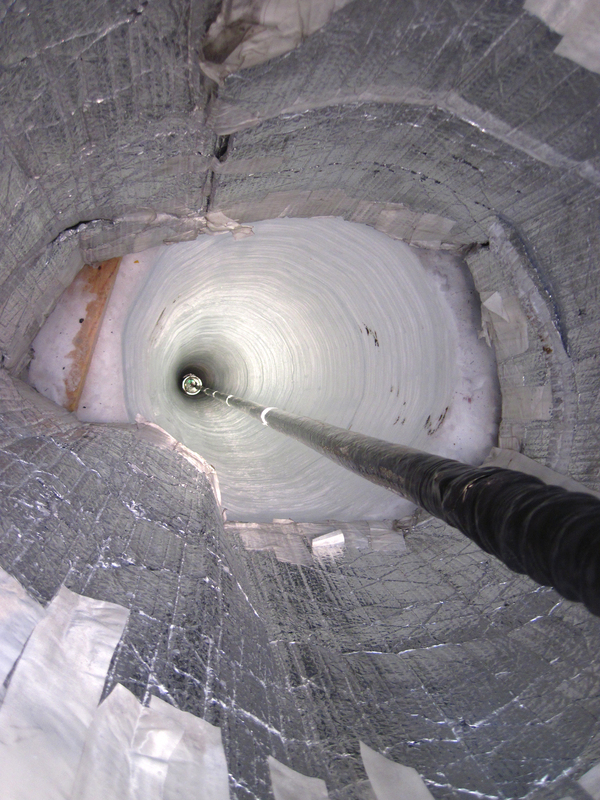 Such eyes are still searching for neutrinos at depths of 1,450 to 2,450 meters. IceCube is quite literally a cube in the ice, a subterranean giant, one kilometer along each edge, with only a modest station on the surface bearing witness to its existence. As with almost all projects of this type, the observatory is an international venture. The primary funding comes from America's National Science Foundation (NSF) but the German Federal Ministry of Education and Research (BMBF) also contributes. A total of more than 250 physicists are working on this grand experiment. They come, among others, from Japan, Switzerland, the US, Korea, and Germany. Köpke was already involved in the previous project AMANDA. 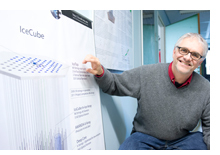 His work group is part of the 'Precision Physics, Fundamental Interactions and Structure of Matter' (PRISMA) Cluster of Excellence at Mainz University. 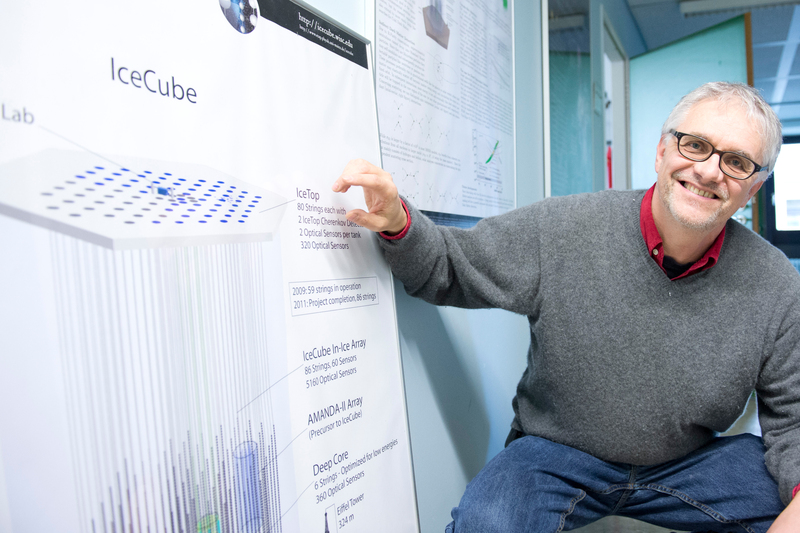 "IceCube is one of the projects in which scientists are still very actively involved to this day," reports Köpke. "We have regular teleconferences and meet twice a year. One of my Ph.D. students is at the station right now." Köpke then comes back to a subject that is very important to him: Of course the observatory is unique and enormous progress has been made with the neutrino detecting technology. "But it is a group of postdoctoral researchers and doctoral candidates that we also have to thank for our discoveries. They developed extremely sophisticated analytical approaches. In principle, they used one part of the observatory to shield another part in which they performed their measurements." Another eight high energy neutrinos have since been discovered. "One of which has double the amount of energy of the neutrino that previously had the highest energy," says Köpke. This means that the ground-breaking results have again been confirmed. "A lot of people – including myself – did not consider this to be possible." Köpke lifts the glass ball containing the eye from his desk and places it on top of an adjacent wastepaper basket. "That will stop it rolling away," he says with a smile. 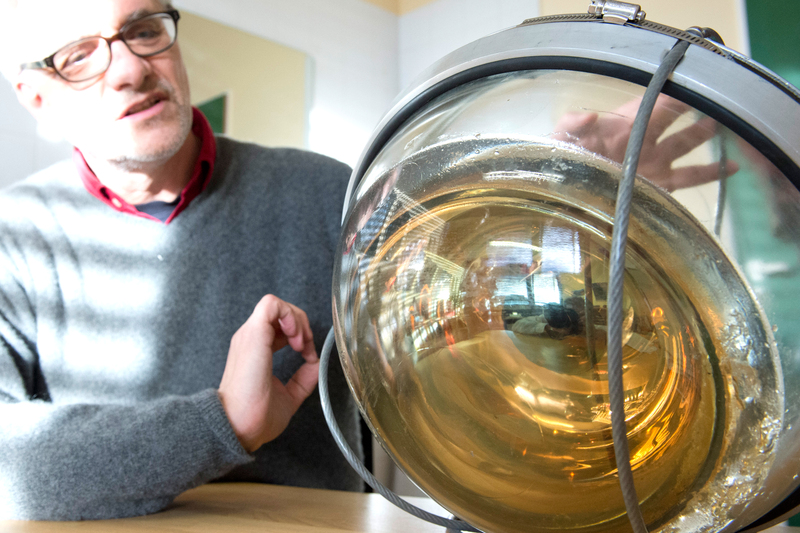 The 5,160 eyes in the ice will be further monitored over the next few years and provide deeper insight into the universe – and Professor Köpke is not the only one who thinks so.